Sora was born on a place called Destiny Island, where he grew up with his friends and family. However, when he was fourteen, the place was swept by a wave of Darkness, and Sora was carried on a strange adventure across other worlds. 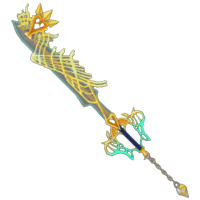 He eventually learned that a group of faeries from the land of Arcadia had chosen him to fight the powers of Darkness that might threaten the various worlds of the metaverse, and so he became the wielder of the magical Keyblade, opposing those who would do harm to the world of Arcadia and its sister realms. He met many allies and enemies along the way, encountering many strange stories and situations, but he always returns where he is needed, even if he never truly finds his way home again. Sora is, on one level, just a really good guy. He's pure of heart, not in the sense that he's been totally sheltered his whole life, but in that he really is good and compassionate within himself. He cares a great deal for others, even those he doesn't know, but he'd do almost anything for a friend. He is very open-minded and tolerant of others and honestly doesn't understand the word "hate" on an emotional level — he's never felt it before. In some ways, he really is still an innocent. He's been through some rough times, but he's always come out with his idealism and good heart intact. He's naturally very straight forward, disinclined to lie or decieve, and rather friendly. He tends to believe the best of others whenever he can and accepts them for who they are quite readily. Everyone has flaws, and so he is not inclined to condemn others for their shortcomings when he knows he has plenty of his own. 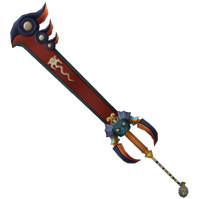 This blade allows Sora to open doors to other worlds and travel through them. 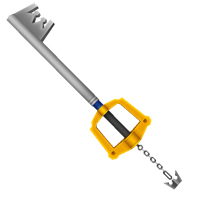 It does resemble a large key, only its "teeth" are razor sharp, and it is made of powerful magic and cannot be broken. It can be collapsed down into a pendant that resembles a tiny golden crown, and Sora can summon it at will. It does especially severe damage to creatures of darkness, while it does only minimal effect against light-aligned beings. 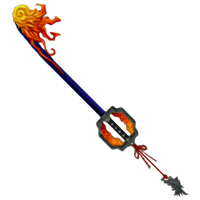 Sora can cast several very basic spells, such as a fireball, a blast of freezing cold, and a simple lightning bolt. He can also cure minor injuries with magic. 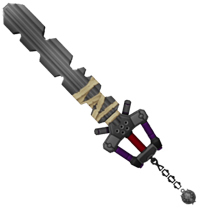 When wielding the Keyblade, Sora's magic makes him faster and stronger as well, enabling him to perform otherwise impossible feats of strength and acrobatics, as well as making him tougher against taking damage. Sora has developed the ability to shift his form and clothing to fit the other worlds he visits. When he changes form, his clothing or appearance change and he gains abilities that suit the world he's visiting. Sora wears a caped costume and gains the ability to fly at high speeds and carry heavy loads. 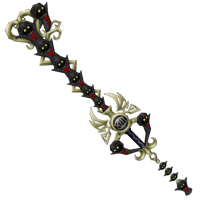 If he "hides" his keyblade, he can also trade its immediate power for greater unarmed strength and durability in combat. His spells must be used in the form of "vision" powers, like eye beams. Sora can run at super-speed, allowing him to cross water, go up the sides of buildings, and do other speed stunts. He cannot attack or dodge using the speed. His spells may be used normally when not at super speed. Sora can use gadgets like a glider cape and grappling line to travel around like a costumed crimefighter. His spells all become utility belt gadgets. 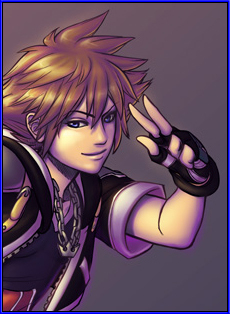 Sora gains fangs, claws, and animalistic senses, such as night vision, acute hearing, and a keen sense of smell. He also becomes stronger and faster and gains a healing factor, but he cannot cast spells. Sora gains shiny armor and gains holy protective powers. He is much harder to hurt and, though he loses access to all his offensive spells, he becomes very resistant to magic and mystic influence. Sora becomes a stealthy thief who can melt into the shadows like a ninja master. He gains the ability to steal and pick pockets with great skill, and he is much faster and harder to hit, though his offensive abilities are halved. Sora is charismatic and charming, and he's very good at making friends and speaking sincerely to others. Apart from that, he's quite athletic and a very capable fighter with a sword, even if it's not the Keyblade. He knows a bit about sailing and survival, and he has picked up a variety of knowledge from his travels throughout the world. Sora is loyal to a fault, and he will do literally anything, even sacrifice his own life, to protect others. He is also quite naive and can be easy to trick or fool. He cannot easily be mind-controlled or compelled, but his mind would be quite easy to read for a telepath. Also, he has no powers when he has not summoned the Keyblade.